As we get ready to celebrate Earth Day later this month, consider ways now to reduce the food packaging you bring into your home. 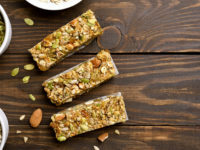 One way to do that is to eliminate single-serve items and buy in bulk, then repackage bulk foods into smaller servings using your own reuseable containers. Even more fun: make the snacks yourself! Chips and snack bars are two things we all like to eat on the go, but that often means single-serve packaging. Check out this easy recipe for Baked Tortilla Chips from our blog and this one for Mango Coconut Snack Bars, then follow the links below for more healthy, make-your-own snacks! After reading recipes, make a variety of snacks and then invite friends over to celebrate Earth Day with you this year on Monday, April 22! Be sure to provide cloth napkins and reuseable plates and utensils to minimize your waste. Store any leftovers in reuseable containers. You can search online for more make-your-own snacks, but here are some to get you started!